Composite image of asteroid 2007PA8 captured by the Goldstone observatory over October 28-30 (Credits: NASA/JPL-Caltech/Gemini). 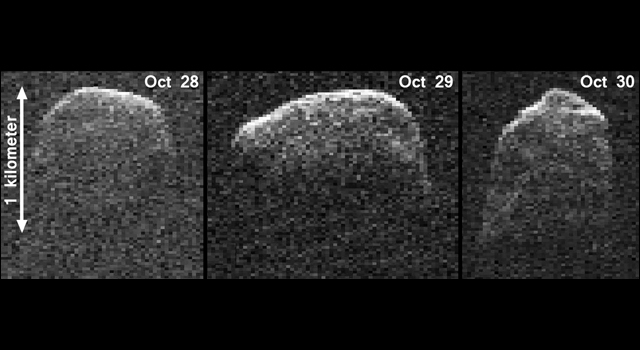 NASA released images of a wide asteroid approaching Earth from October 28 to October 30. The images were taken with the 70-meters wide Deep Space network antenna at Goldstone, California. The images, taken from above its north pole, are a result of radio waves emitted from the Goldstone antenna and reflected off the asteroid’s surface. The asteroid, called 2007 PA8, was 9 million km (5.6 million miles) from Earth on Oct. 30 when the last image was taken. It reached the closest point to our planet on November 5, coming roughly within 17 times the Earth-Moon distance or 6.5 million km. Although it is classified as a “near-Earth asteroid”, the huge rock’s orbit has been well characterized and is known to pose no threat to Earth. Asteroid 2007 PA8, as its name suggests, was discovered in 2007 by Lincoln Near Earth Asteroid Research astronomers from the Massachusetts Institute of Technology. Since 2007 PA8 will not fly so close to Earth for the next 200 years, NASA decided to use the opportunity to grab radar observations of the asteroid. This is not the first time NASA has used radar observations to capture images of near-Earth asteroids. On November 8, 2011, the 400-meters wide 2005 YU55 passed between Earth and the Moon’s orbital path. The observation campaign of that incident captured invaluable radar and optical images of the huge rock. The Goldstone observations, along with those from Arecibo in Puerto Rico, are part of NASA’s Near-Earth Object Observations Program, sometimes referred as “Spaceguard”. Managed by the Jet Propulsion Laboratory (JPL), the program aims to discover, characterize, and track new objects, so as to identify potential threats to our planet. NASA scientists along with astronomers from all over the world regularly track near-Earth objects searching for potential hazards using telescopes both on Earth and in space. This safety observation net tracks new asteroids all the time, such as 2012 VD5 discovered on November 6 , passing 1.54 times the Earth-Moon distance. That space rock, just 20-meter wide, wasn’t classified as hazardous.